6/14 Cup of Coffee: With Boston, Pawtucket, and Portland all off last night, the lower levels of the minors completed a sweep. 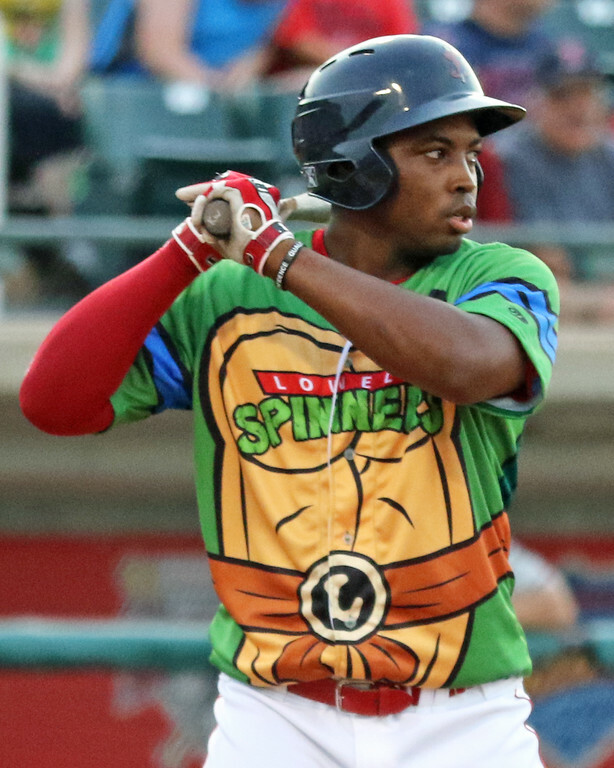 Yoan Moncada was on base four times for Salem, while Josh Ockimey and Kyri Washington (pictured) each tormented the Crawdads. Matt Kent's strong start combined with Moncada's offense helped Salem clinch the Carolina League First Half South Division Title. A quality start from Matt Kent led the way in Salem's win over Potomac. Kent fired the first 6 1/3 innings, allowing one run on five hits, walking one and striking out five. Over his last 25 innings, Kent has only allowed five runs, good for a 1.80 ERA while striking out 21. Jamie Callahan followed with three strikeouts over 1 2/3 innings, and Simon Mercedes closed it out with a scoreless ninth. The game was tight until the eighth when Salem scored four runs to blow it open. Yoan Moncada was on base four times with two doubles and two walks, though surprisingly he did not attempt to steal. Moncada has been on fire over the last two weeks, hitting .378 with 11 doubles over his last 12 games. Mauricio Dubon went 2 for 4 with a walk, and Deiner Lopez and Bryan Hudson each added a triple. The middle of Greenville's order did all the damage as the Drive edged the Crawdads. Jose Almonte struck out seven over five innings, allowing three runs on six hits and two walks. Jake Cosart picked up his second win of the year with two hitless innings of relief, walking two and striking out three, and Adam Lau got the save with two scoreless innings. The combination of Josh Ockimey and Kyri Washington almost single-handedly won the game for the Drive, with Ockimey going 2 for 3 with an RBI double and a walk, and Washington going 3 for 4 with a solo home run and two RBI singles. Michael Chavis went 1 for 3 with a walk and he is now 8 for 20 since returning from the disabled list. A grand slam from Ramfis Berroa was enough to push the first Red Sox squad to victory. Rayniel Adames made his professional debut, going the first four innings allowing four runs, three earned, on five hits. The six-foot-six left-hander walked one and struck out three. Manuel Ramirez came on in relief and allowed only an unearned run over three innings, and Angel Padron and Juan Florentino each followed with a scoreless inning to close the game out. Berroa drove in five of the six runs for the Red Sox as part of a 2-for-3 performance that also included a double. Carlos Pulido recorded the only other hit as the Red Sox capitalized on their few opportunities to put runs on the board. The second Red Sox squad used a 14-hit attack to drop the second Rays squad to 0-8 on the young season. Jose Zacarias struggled mightily in his season debut, walking five and surrendering four runs in only two innings. The bullpen was able to limit the damage, led by Rayniel Moreno and Shair Lacrus who combined to throw five scoreless innings and strike out six. The offense was led by Keibert Petit, who went 3 for 5 with a walk. Petit now has five walks in only 18 plate appearances. Not to be outdone, Kleiber Rodriguez walked four times in this game alone, and the team combined to walk 11 times. Everlouis Lozada, Antonio Pineiro, Albert Guaimaro, and Ronaldo Pulgar all had two hits, with Guaimaro adding a double. Player of the Night: It has been an impressive full-season debut for Kyri Washington, who is now slashing .298/.314/.565 after a 3-for-4 performance last night. Washington, a 23rd-round pick in the 2015 draft, has shown great power while he continues to work on his pitch recognition and approach. He is still striking out in 28 percent of his at-bats while walking in only three percent, but he is proving to be a worthwhile gamble in the later rounds of the draft.